Estimate the cost of installing new seamless gutters and downspouts for your home. Select various sizes, gutter materials (aluminum, zinc, copper), as well as optional accessories. Length of Gutters Ln. Ft.
Gutter Type 5" Aluminum 6" Aluminum 6" Copper 6" Zinc 6" Zinc "K" 6" Copper "K"
Before you can use the tool, you need to measure the total length of all horizontal (eave) edges of your roof that will receive new gutters. You also need to count all Inside and Outside corners and Downspouts (drain pipes). 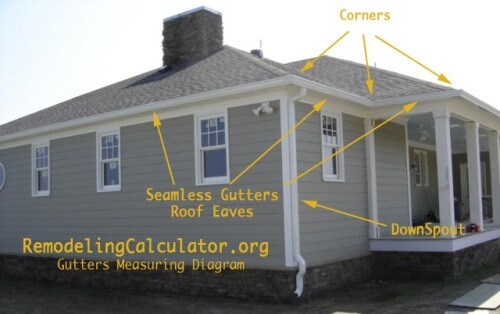 To accurately estimate your total cost, you will need to measure the length of ALL horizontal (eave) ends of your roof. This is where new gutters will be installed. If you have a gable roof - you will be installing on the front and back (2 sides) of your roof. If you have a HIP roof type, then you will be installing gutters on all 4 sides. If your roof overhangs the house exterior wall, add overhang lengths to to your measurements. Count all corners, and downspouts (drain pipes). Do not worry about elbows on downspouts. Select the number of floors below the roof line. Select if you need to remove old (aluminum or plastic) gutters, and if you need new leaf guards installed. The average price for removing old gutters and installing new 5" K-type (residential) seamless aluminum gutters on a one story house is about $10-12 per linear foot. This includes both sides of the house and downspouts on each end of the gutter for proper drainage. However, there are many other material options that will change this cost per linear foot, up or down. Note that if the total price is less than $425, a minimum charge will be provided, as most contractors will not work for less. For example - if you needed 5 feet and 1 downspout installed, you would still pay a minimum of around $400. Here is a brief summary of the differences between the most popular seamless gutter types. K-style: these gutters have a flat bottom and back. At the same time, the front is usually curved or looks like an ogee (replicating crown molding on the ceiling). There are many beautiful shapes and decorative designs to choose from, so you can create a customized look for your home. Half-round: these are simple looking, no frills half-round shape tubes. Don't be deceived by their seemingly plain aesthetic. Half-round gutters look beautiful on classic and historic homes. The biggest difference between these two types of gutters is the price. K-style gutters cost as much as 50% more per linear foot than half-rounds. They also hold twice as much debris, leaves, water, etc, because they are deeper. In terms of width, both type are either 5 or 6 inches wide. Here are the most popular materials used to manufacture seamless gutters, their features and how much they cost per linear foot. Aluminum is the most frequently installed gutter material, favored by about 90% of homeowners. Aluminum's greatest benefits are that it will not rust, is very light weight and fairly easy to install, even for a DIYer. Another benefit is that aluminum gutters can be painted and is manufactured in a variety of stock colors that match many architectural house styles. If you live in the snow country, its strongly recommended to install .032- or .027 gauge aluminum (this is thicker than standard) to ensure long lasting service. All aluminum seamless gutters have an "ogee" or a so-called K-style profile. If you want round, box or other type of gutter, it will not be seamless. It will be a custom job and will cost significantly more than regular K-style. Costs start at $10 per linear foot and increase depending on installation difficulties. Its best to order primary aluminum materials, as opposed to secondary, because they are made of recycled metal and may not be as durable. Galvanized Steel Gutters Steel is considered to be a very strong metal and these gutters will stand up well to damage from ladders, branched, impact from falling objects, etc. Steel gutters are available in numerous colors and can also be painted. However, their biggest downside is that eventually they will rust. This may happen as quickly as 5-7 years after installation, at which point replacement may be necessary. Because of rusting, most homeowners choose aluminum gutters over steel, even though they are more expensive. Price for steel gutters starts at $9-10 per linear foot installed. It is also possible to install stainless steel gutters, which will never rust. However, they cost double, with prices starting at $20 per linear foot installed. Gutters made of copper can be both seamless (K-Style) or 10 foot sections with soldered seams, made in either half-round shape or box shape. Inside and outside corners of copper metal gutters should be soldered (whereas for aluminum and zinc, they are caulked with special "gutter seal"). Copper gutters also use special round or box copper drain pipes, and custom-made elbows. 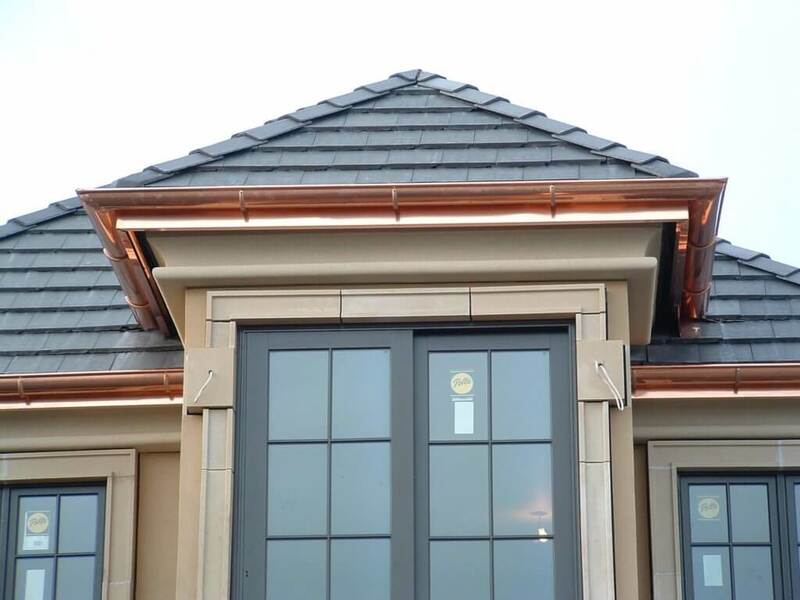 Because of a much higher materials cost and a lot of custom labor, the cost of installing copper gutters starts at $40 per linear foot and goes up from there with complexity of the job. These gutters are pre-made, and come is 10 foot sections - usually half round profile. RheinZink is on of the biggest zinc gutters and roofing manufacturers in the world, and offers a complete set of accessories - hangers, drain outlets, downspouts, end-caps, corners, etc. These are only accessible for purchase via special order, through roofing suppliers such as ABC, Beacon, Bradco, Harvey, Heritage, and other building materials and roofing suppliers. Other manufacturers of zinc gutters include OrnaMetals and some smaller, less known firms. Zinc cannot be produced on site, unlike aluminum and copper, because zinc is a very hard metal, and requires special machinery to bend and form. Zink also cannot be seamless. Zinc gutter costs start at about $45-50 per linear foot, installed. The price increases as job complexity goes up. Optional leaf guards are installed after section is attached to the roof edge. Downspouts are added in the end. Important - Replace Rotted Fascia Boards!! If you are replacing your old gutters and have had some roof leaks / water damage in the past, or if you are suspecting that your fascia boards might have water damage / rot, it is best to replace these boards with new wood or PVC / AZEK boards. If you do not replace rotted fascias, your new gutters can fall off long before they reach end of life. You should budget to spend about $13-14 per linear foot for new PVC boards and trim (this includes removal of the ol fascia). If you are interested in metal trim, the total price will be about the same. Most new seamless gutters are made on site or in the shop and delivered to the job site. If the length of each run is over 30 feet, the product will be formed on site, as it's virtually impossible to transport such long sections without doing any damage. Once the section is rolled out of the machine, it is measured and cut to exact length, which is about 2 inches longer than roof edge, to capture water that comes off roof sides. Once a section is cut, end caps are installed. Holes are punched or cut about 6-8" from each end or were needed, outlets are installed and all penetrations are sealed with gutter seal caulk. Then hangers with self-tapping screws are installed every 18" - 24". Other types of hangers can also be used, but not recommended for K-Style. Once all accessories are installed, a complete section is lifted by 1, 2 or 3 installers and is screwed to the fascia board, making sure that outlets are pitched slightly down from the rest of the gutter to create positive slope for better drainage. This advice can help you save money on your new gutters, as well as ensure that installation is properly done. 1. As we discussed earlier, the average cost to install seamless gutters is around $10-12 per linear foot. Regardless of where in the US you live, most contractors will charge in this ball park. If you are getting pricing over $17 per linear foot, you are most likely being ripped off and should stay away from this company! 2. 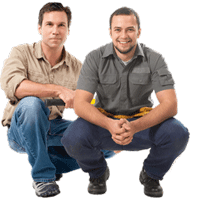 We recommend getting 3-4 free estimates from local reputable contractors. This will help you compare pricing and find a pro with the best references. 3. You can get a small discount of around 5-7% from a company that has their own roll forming machine. They will come in and manufacturer your gutters right on site. 4. Make sure that your contractor installs gutters with proper slope. This is one of things that can go wrong with installation. The drains should be BELOW the low point of your gutters; otherwise water will stand there, contributing to rot and mold growth. 5. It is very important to replace any broken or rotted fascia boards behind the gutters. This is their nailing surface, and if the boards are falling apart, your new gutters will simply not stay in their place. 6. If you live in an area that gets a lot of snow and ice dams, it is best to install leaf guards. These will help minimize the damage that ice dams cause. 7. You really don't need to spend money on "premium" leaf guard systems. Simple options sold in big box home improvement stores cost a lot less, work just as well, and are much easier to clean and remove. 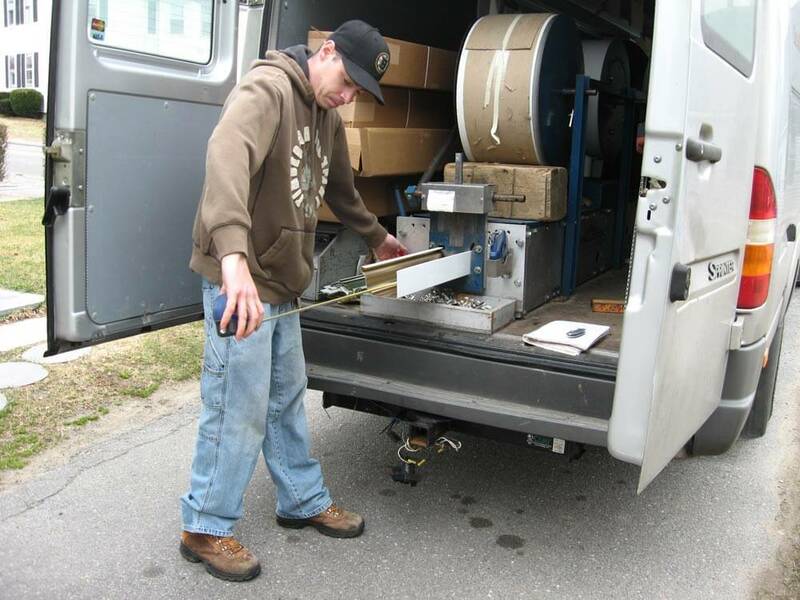 How do you figure how much of aluminum coil to buy for your gutter machine if the wholesaler charges by the pound? Example: if I need 50ft of gutter on the house how much coil do I need) what’s a decent price for the material? If you need 50ft of gutter, buy it from local seamless gutter company. Most will sell just materials. If you WANT to be the seamless gutter company 🙂 … then you need to get in touch with Machine Sellers / Coil Suppliers … you don’t need to buy new machine, but these suppliers are selling both. I’ve been looking at redoing the gutter to my home for a while now. As you said here, there are multiple material choices to go with so I should look at those and see what I want to choose. Of those listed, I think I’d go with aluminum as they are the cheaper option, and the most common. I’d also be sure to get a professional to come and install them for me as I wouldn’t have the means to do so myself.